This article is about the 17th century merchant-trader in Asia. For the Canadian politician and Member of the Legislative Assembly of Lower Canada, see François Caron (politician). A map of Japan in François Caron's "A True Description of the Mighty Kingdoms of Japan and Siam". François Caron (1600–1673) was a French Huguenot refugee to the Netherlands who served the Dutch East India Company (Vereenigde Oost-Indische Compagnie or VOC) for 30 years, rising from cabin boy to Director-General at Batavia (Jakarta), only one grade below Governor-General. He was later to become Director-General of the French East Indies Company (Compagnie française pour le commerce des Indes orientales) (1667–1673). He is sometimes considered the first Frenchman to set foot in Japan: he was actually born in Brussels to a family of French Huguenot refugees; but he only became a naturalized citizen of France when he was persuaded by Colbert to become head of the French East Indies Company, which was intended to compete with the Dutch and the English in Asia. He disputes that honour with the French Dominican missionary Guillaume Courtet. Caron began as a cook's mate on board the Dutch ship Schiedam bound for Japan, where he arrived in 1619. His language skills had developed; and in 1627, he traveled to Edo as the interpreter for the VOC mission to the shogunal capital. He is not quite the first known instance of Franco-Japanese relations, since he was preceded by the visit of Hasekura Tsunenaga to France in 1615. The Dutch VOC trading factory in Hirado. 17th-century engraving. Caron stayed in Japan for over twenty years, from 1619 to 1641, eventually becoming the VOC Opperhoofd (chief factor or merchant) in Japan. During this period, he married a Japanese woman (the daughter of Eguchi Jūzaemon) and had six children. His entire family followed him to Nagasaki when the Japanese forced the Dutch to abandon their outpost at Hirado. Then his family moved with him to Batavia when he left Japan in 1641. In 1626, Caron was working in Hirado as full assistant. On 9 April 1633 Caron was promoted as a senior merchant, making him the second ranking Company official in Japan. On 12 February 1639 he succeeded Nicolaes Couckebacker as President and head of the Company's trade in Japan. The Company's headquarters were moved from Hirado, while he had put a Christian year on the warehouse (1638), to Dejima in Nagasaki in 1641. "A True Description of the Mighty Kingdoms of Japan and Siam" by François Caron, German Edition, 1663. 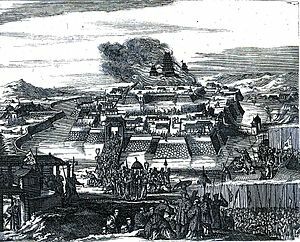 Illustration of the Siege of Osaka, from Caron's book: "The Burning of Osaka Castle"
In 1641, Caron's Japan contract with the company expired, and he went to Batavia awaiting a transfer to Europe. At that time, he was nominated member of the Council of the East Indies, the governing body of the VOC in Asia, next to the Governor-General. On 13 December 1641 Caron sailed back to Europe as commander of the merchant fleet. Although he was rewarded handsomely for his services with a capital of 1,500 guilders, he again left for Asia in 1643 aboard the Olifant. In September 1643, he headed an army of 1,700 men against the Portuguese in Ceylon. In 1644, Caron was then named governor of Formosa (Taiwan); and he was the chief VOC official on the island until 1646. During this period, Caron his achievements included restructuring the production of rice, sulfur, sugar and indigo, and moderating the trade with Chinese pirates. He had to return to Batavia in 1646. In 1647, he was appointed Director-General, second in command after the Governor-General. In 1651, Caron was recalled to the Netherlands, together with Cornelis van der Lijn, due to allegations of private trade, but he successfully defended his case, and was able to resign with honor from the Company. The arenas of French rivalry with England and Holland expanded to Asia in 1664 when the French Finance Minister Jean-Baptiste Colbert persuaded Louis XIV to grant a patent to a newly contrived French East Indies Company. Somehow Colbert managed to entice Caron into accepting a leadership role in this nascent enterprise. He became the company's Director General in 1665. This action was perceived as treason by the Dutch, and Caron was banned eternally from the Provinces. In 1664, François Caron, sailed to Madagascar. The Company failed to found a colony on Madagascar but established ports on the nearby islands of Bourbon (now Réunion) and Isle de France (now Mauritius). In the late 17th century, the French established trading posts along the east coast. Caron succeeded in founding French outposts at Surat (1668) and at Masulipatam (1669) in India; and Louis XIV acknowledged those successes by awarding him the Order of St. Michael. He was "Commissaire" at Surat between 1668 and 1672. The French East India Company formally set up a trading centre at Pondicherry in 1673. This outpost eventually became the chief French settlement in India. In 1672, he helped lead French forces in Ceylon, where the strategic bay at Tincomalee was captured and St. Thomé (also known as Meilâpûr) on the Coromandel coast was also taken; however, the consequences of his military success was short-lived. The French were driven out these modest conquests while Caron was en route to Europe in 1673. He died as his ship sank off Lisbon on 5 April 1673, while he was returning to Europe. (1636). Beschrijvinghe van het Machtigh Coninckryck Japan und Siam. Amsterdam (in Dutch). (1646). Beschrijvinghe van het Machtigh Coninckryck Japan.] Amsterdam (in Dutch). (1648). Beschrijvinghe van het Machtigh Coninckryck Japan. Amsterdam (in Dutch). (1663). A True Description of the Mighty Kingdoms of Japan and Siam (translated by Roger Manley). London: Samuel Broun & John de l'Ecluse. (1672). Wahrhaftige Beschreibung zweyee mächtigen Königreiche Japan, Siam, und Corea. Nürnberg (in German). ^ a b c Otterspeer, Willem. (2003). Leiden Oriental Connections, 1850–1940, p. 355. ^ Leup, Gary P. (2003). Interracial Intimacy in Japan: Western Men and Japanese Women, 1543–1900). p. 8, 106. ^ a b c Jozef Rogala. (2001). A Collector's Guide to Books on Japan in English: A Select List of Over 2500 Titles with Subject Index, pp. 30-31. Danvers, Frederick Charles. (1888). Report to the Secretary of State for India in Council on the Records of the Records of the India Office: Records Relating to Agencies, Factories and Settlements not Now Under the Administration of the Government of India. London: Printed for Her Majesty's Stationery Office (HMSO), by Eyre and Spottiswoode. This page was last edited on 19 January 2019, at 14:48 (UTC).